Signature needed on a Word document? No problem! Have you ever been sent a Word document that needs your Signature? There’s a couple of ways of getting around this issue. You could print the document, sign it, scan it back in, then email it back.. Or you could print it, sign it and fax it. However, if you don’t have a printer or the time to do that, you could try using one of the signature capture apps on the Android Market. 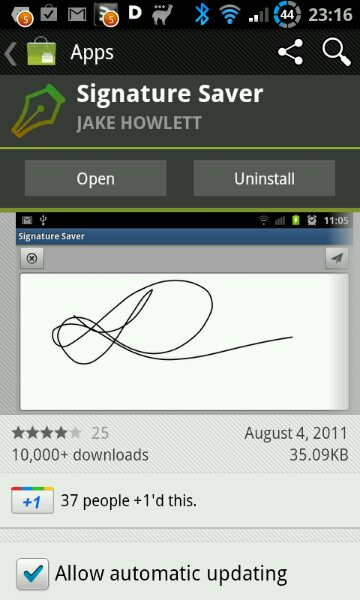 The one I ended up using is called Signature Saver. It’s ridiculously simple to use. Just use your finger to write out your signature, then share the resulting image. I just emailed myself and then posted the PNG file into my Word document. Done. Simple, free and a really time-saver.